Leadcore is as its name hints a woven membrane outer and a lead wire inner. Its main uses are to aid sinking the main line and pinning the last couple of metres of the rig end to the bottom. It is also stiff due to the inner core wire and has a good abrasion resistance. It is very strong with most brands being 35lb - 45lb breaking strain. 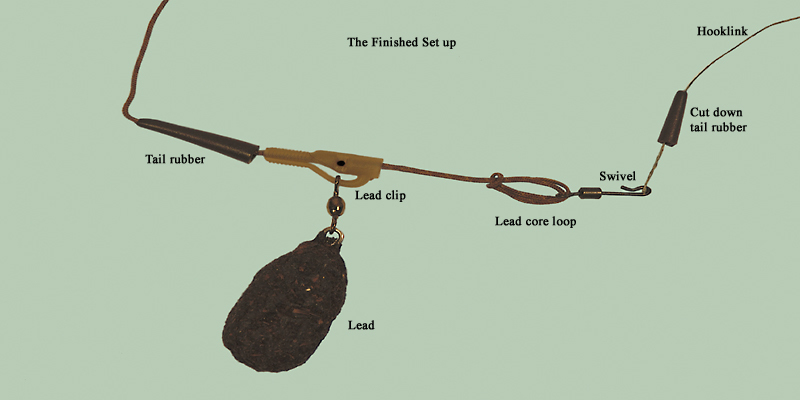 It is of the utmost importance that any items added to the leadcore above the swivel are easily able to slip over the connection between main line and the leadcore, if this is not possible and your main line breaks for some reason the fish may become tethered and die. The leadcore splice works on the Chinese finger trap method where as the outside is pulled tight it shrinks in size and traps itself on the inner part of the spice. There really is no need for glue at all as this could stop the movement of the outer core which needs to stay supple to expand and detract as required to cause the hold. It is very important to check the finished leader for breaks in the inner wire which often worms itself out of the sides, just pull out a small piece break it off and push the end back into the hole it has made, if this is not done it could cause parts of your rig to jam and impede the lead from discharging in the case of a break off. You should check this, both splices and the main line knot before each cast. 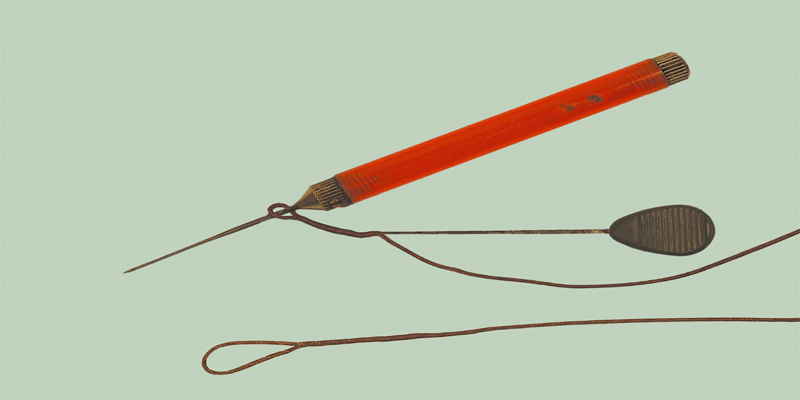 I know of only two ways to make the connection : One is to splice the leadcore making a small loop at the main line end and tying a small knot to this with your main line (my preference is the Polomar knot ).The other is a needle knot where the mainline is passed through the middle of the leadcore and out of one of the sides 3 or 4 times then whipped and threaded back on its self. A small drop of glue can be added to the end of the leadcore or it can be lightly singed at with a lighter to stop it fraying but you should use just enough so not to impede the lead from discharging in the case of a break. 1. Pull out around 15cm of core and break it off, turn the leadcore around to the other end as this will now have no inner core for the last 15cm, you now have a hollow end to make the splice. 2. Pick up the splicing needle and open the gate on the end and push it back flat with the rest of the shank. Find the point where the inner core ends and hook the needle into the outer membrane " this is Point A " facing towards the tag end at " Point C ". 3. Slowly push the needle through the middle of the core in the channel where the inner core would normally be, you should load at least two thirds of the needle with the outer membrane then exit the needle at " Point B ". Wiggle the needle to make the hole at " Point B " slightly bigger. 4. Hook the end of the needle through the end of the membrane at " Point C " and close the gate on the end or the needle. Bunch the membrane on the needle together and push from " Point A " towards " Point B ". The end of the needle should slowly be brought back through the middle of the core with the tag end to exit at " Point A " . Once the needle has exited the core at " Point A " unlock the gate and release the tag end. Slowly pull the tag end back inside the hole at " Point A " then grip the core tight at " Point A " and smooth the spliced join back towards " Point B ". You should now have a large spiced loop at this end. 5. Now do the same at the end, after you have removed the inner core not needed you will have to push the remaining inner core back up to meet your spliced loop at the other end , this is done quite easily by bunching up the outer membrane and pushing the inner core along the inside tunnel in the core. Once you have formed the second loop insert your baiting needle into the loop and pull the tag end to reduce the loop, as at this end you only require a small loop big enough to thread your mainline through to attach the finished leader. After reducing the loop smooth the outer core back towards " Point A " snip off the remaining tag end and then tuck it back into the hole at " Point A ". 6. To attach the Main line you should use the smallest strongest knot possible I use the " Polamar knot "
7. The finished rig, after tying the leader to your main line thread on a tail rubber then the leadclip, followed by a swivel. I prefer a quick change swivel but you can use any swivel you wish as long as it fits the leadclip.It is also possible to use an inline lead just remove the plastic inner and use an Armaled " Shokka Plug ''. An easy made running rig is to thread on the lead then a bead and then the swivel. 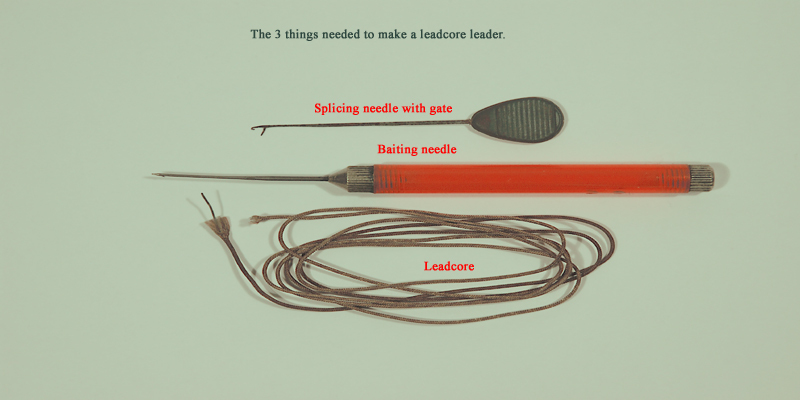 The Needle knot (below) is used to tie the leadcore leader neatly to your mainline where the smallest possible join is necessary. A join like this is generally used where a Silt/Helicopter rig or tail rubber is in use and will allow the bead and rig swivel to pass over the join easily should you be unfortunate enough to break off..... safety should always come first when putting your rigs together!